An unstable base leads to more cracking and eventual pavement failure. Cracks that form intersections are potholes waiting to happen. What is Hot Pour Crack Filling? 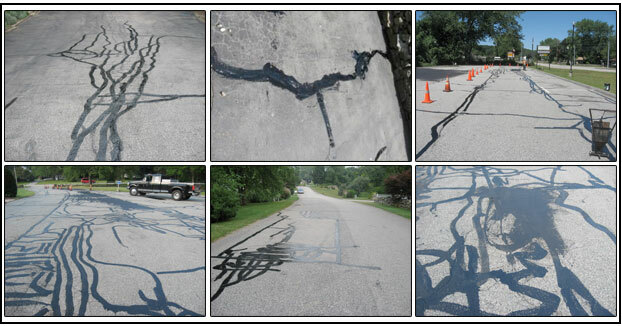 Hot Pour Crack Filling is the process of injecting a hot pour rubberized sealant into isolated cracks in the asphalt pavement to prevent water from penetrating and deteriorating the sub-grade and stone base. It makes good economic sense to treat pavement problems while they are still small. 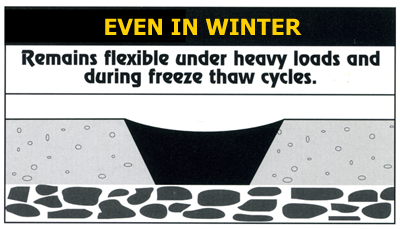 You can delay costly resurfacing and repair of your pavement's substructure with timely preventative maintenance. In fact, the total annual investment of regular maintenance can cost four-to-five times less than if you allow your pavement to deteriorate to poor condition. Complete rehabilitation and resurfacing can be a major expense. In those cases, a sharp decline in the condition of asphalt surfaces may be observed after only 10 years, with critical repairs called for after only 15 years. Compare this with carefully and regularly maintained systems in which roadways may remain in good or better condition for as long as 25 years. Also, during the first few years, after the initial paving, parking lots are usually in good condition and very little money is needed for parking lot maintenance. But, when repairs are necessary, the expense can appear to be high if not properly budgeted. The service given by timely, and professional repairs, extend the pavement life cycle at minimal expense. This drop-off is so pronounced that there can be a huge difference in costs—as much as 400%—between either maintaining pavement at its optimal condition or repairing the pavement (chasing potholes) only after the condition has become critical. SHOem Roadway Services will be glad to evaluate the current condition of your parking lot, make recommendations, and help schedule a regular maintenance program.